A couple of new video clips and photos from the sessions can be seen below. 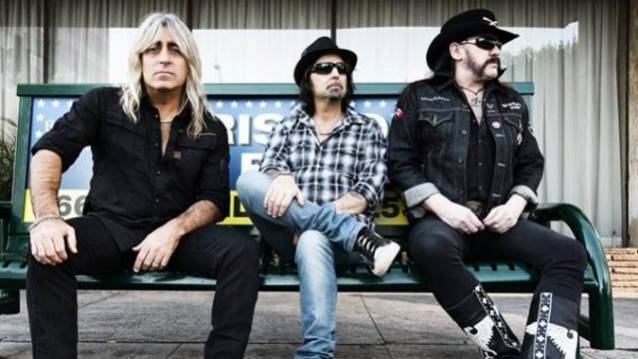 MOTÖRHEAD's song "Heartbreaker" was nominated in the "Best Metal Performance" category at this year's Grammy Awards. MOTÖRHEAD frontman Lemmy Kilmister, 69, in 2013 suffered a haematoma (where blood collects outside of a blood vessel), causing the cancelation of a number of the band's European festival shows. He was also reportedly fitted with a defibrillator because of heart problems. The reissue of MOTÖRHEAD's 21st studio album, "Aftershock", was made available on August 26, 2014 via UDR/Motörhead Music. The CD was helmed by longtime producer Cameron Webb (MEGADETH, DISTURBED). The expanded edition contains a bonus live CD — also recorded by Webb — consisting of live material comprised from the band's historic appearances in early 2014. Post by For Those About To Rock. "@myMotorhead: Back in the studio hard at work on our next album! #MotörheadForLife pic.twitter.com/uZGMOUfxRN" Long Live Motorhead !